The Paris Feast: 14 Tips for a perfect succulent juicy roasted chicken which I learned in France. 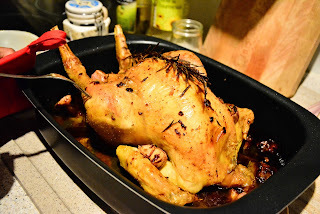 14 Tips for a perfect succulent juicy roasted chicken which I learned in France. Now here are my tips. 1. The most important thing is the raw material. 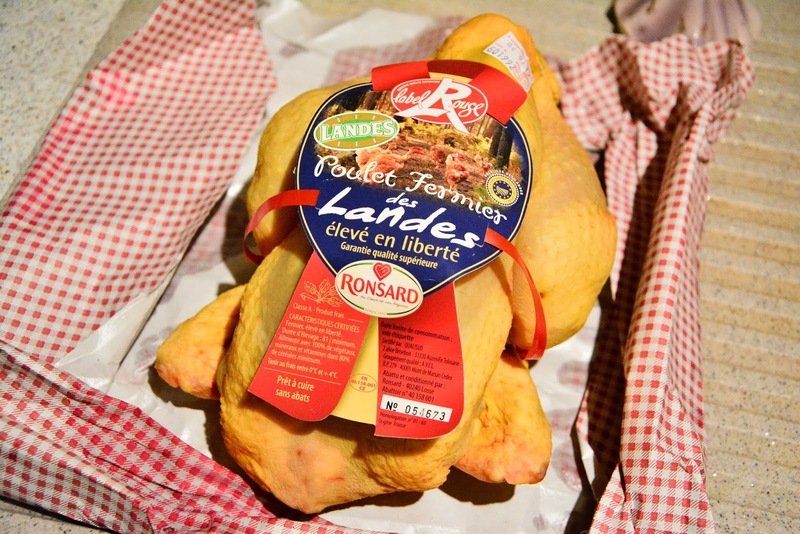 The Chicken: I prefer to buy a superior quality chicken that has been allowed to roam around in a free space and fed on only vegetable materials, vitamins and carotenoids. 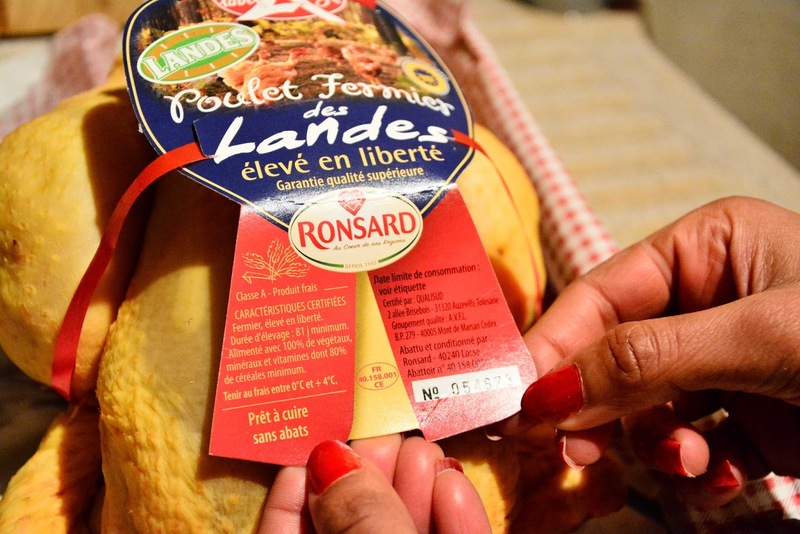 Such superior quality is assured in France by the Label Rouge (Red Label) which is equivalent to “Natural, Grass-fed, Free rang, No hormones added” certification in the USA. The chicken that I used is from Landes in South-Western France and the skin was slightly yellow in color. This yellow skin color results in a beautiful golden brown roasted chicken. I prefer to buy all the ingredients from the farmers market rather than any hypermarket. Lemon Zest: I prefer preparing the zest myself. While scraping the skin of the lemon to make fresh lemon zest one has to very careful not to scrape the white skin of the lemon. The white skin gives a bitter taste to the chicken. 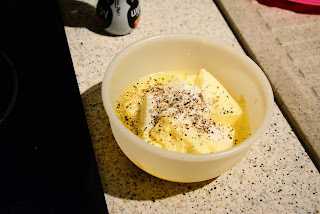 I prefer to use unsalted butter from the Normandy region of France due to its extra creamy texture. For the olive oil I always use “extra virgin olive oil cold pressed” due to its mild smooth flavor. 2. For the roasting tray I always make sure that it is a non-stick one and that it is big enough to fit the chicken, leaving some free space around it. 3. 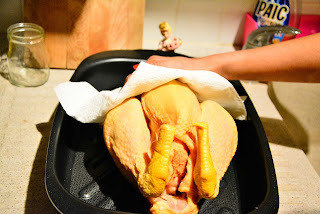 After washing the chicken make sure to remove the water by patting it well with kitchen napkins. 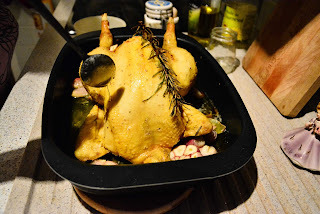 Otherwise the butter will not stick to the skin of the chicken. 4. Massage the chicken well with unsalted butter that has been seasoned with salt and freshly ground black pepper. While massaging you have to be careful that you don't end up tearing the skin. 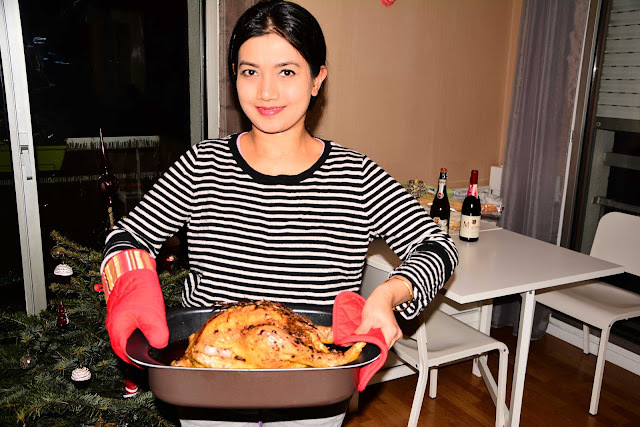 The better the spa session is, the juicier and succulent the roasted chicken will be. 5. With the help of your finger slowly separate the skin from the flesh in one of the sides of the leg and slowly push a dollop of seasoned butter into it. 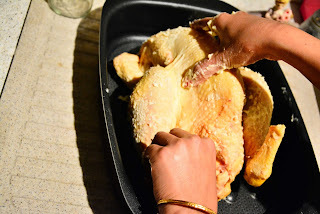 Press it by placing your fingers flat (not with your fingertips, you may end up tearing the skin, this happened to me on a couple of previous occasions) on the chicken so that it gets inside well. Be careful while pressing it so that the skin doesn't tear apart. 6. 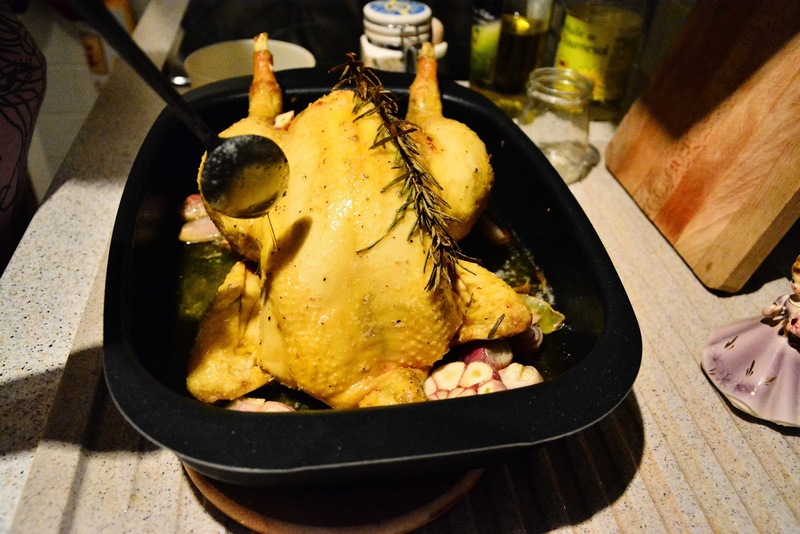 Place the chicken on a bed of unpeeled garlics and shallots. 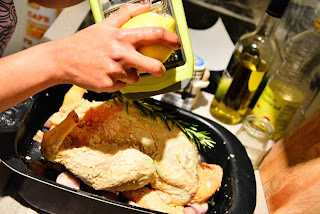 Place some strands of fresh rosemary and fresh lemon zest underneath the chicken. 7. 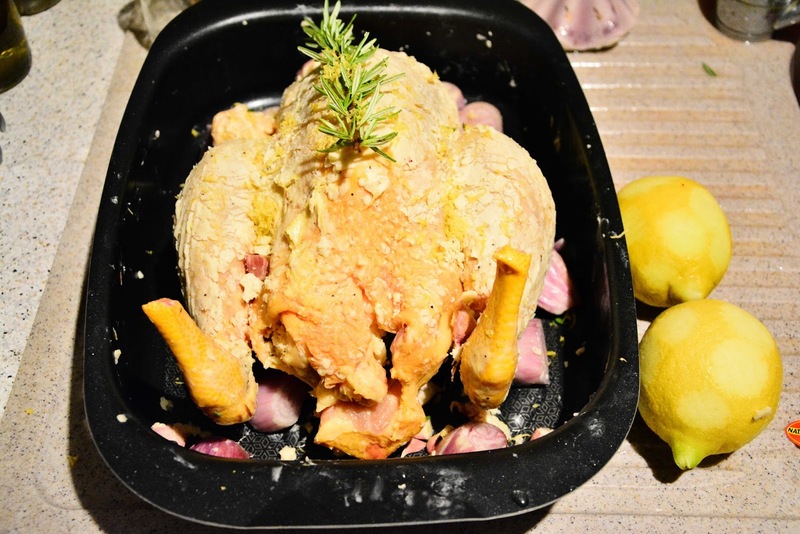 Fill the cavity with unpeeled garlic, shallots, fresh rosemary and lemon zest. 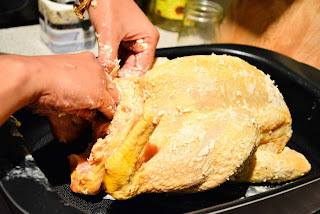 Cover the opening of the cavity with any extra skin hanging from the chicken. 8. Remember to place some unpeeled garlic, shallots, fresh rosemary and lemon zest in the joints of the legs and wings. This adds flavor to the chicken from each and every corner. 9. Poke the skin underneath the joint of the legs and wings. Be careful not to tear apart the skin of the chicken. This helps to amalgamate the flavors in the chicken. 10. Bathe it in olive oil nicely. 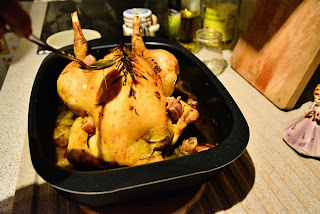 I used 460ml of oil and 190 ml (200 grams) of molten butter (650 ml total) for 2 kg chicken. 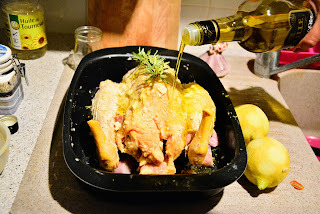 This ratio of chicken to oil+butter helps to make the chicken roast juicy and succulent. 10. 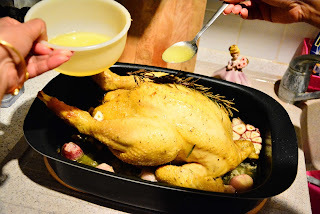 Remember to bust the chicken twice with the buttery fluid that has collected in the pan. This makes the chicken succulent. This is during the second busting after 1 hour after the first busting. 11. After the chicken has been roasted (for about 2 hours at 200°C/392°F), check whether it is done by pricking a fork in one of the legs. If the juices run clear and if the fork pricked easily, it means the chicken is done. 12. 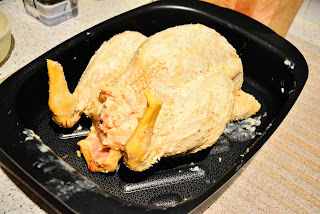 The last and one of the more crucial step is to rest the chicken by covering it with aluminum foil for the same amount of time that you took to roast it. When you roast meat, the fluid and moisture moves outwards and if you cut it immediately after taking it out from the oven, the moisture escapes, making the meat dry. Resting it covered helps to redistribute the moisture in the meat, making it juicy and succulent. 13. 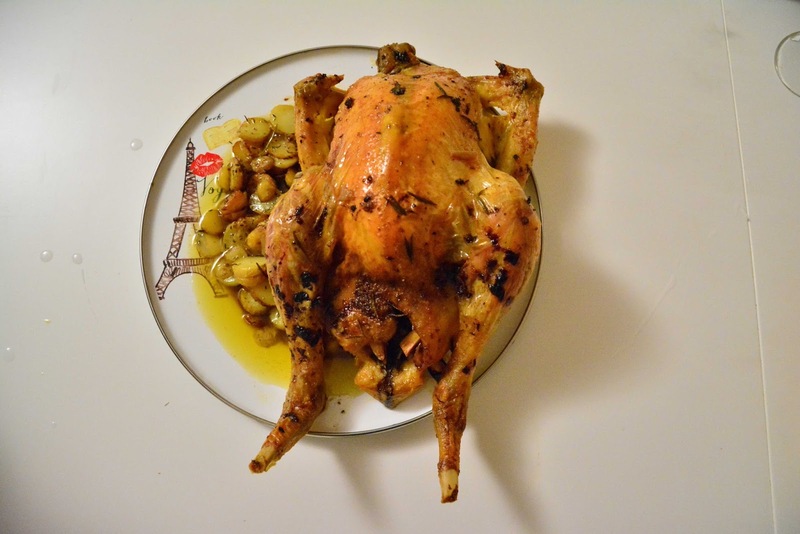 This is the final chicken. 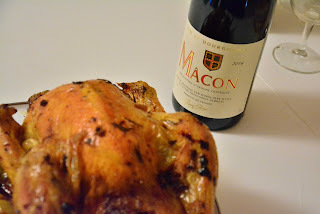 Follow on after the picture for some tips on choosing your wine to go along with roasted chicken. I served it with a cider sauce (follow this link for the recipe) and pan fried potatoes. 14. 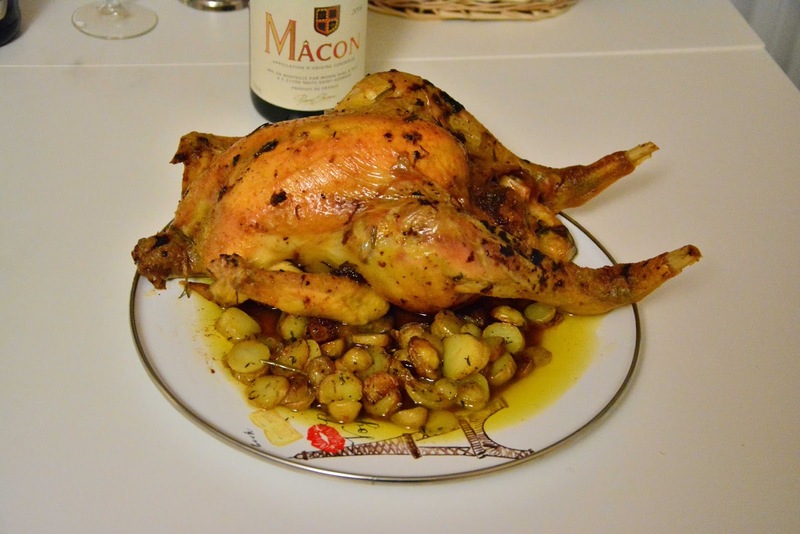 The Wine : The ideal wine with Chicken roast is a young, moderately dry red wine. 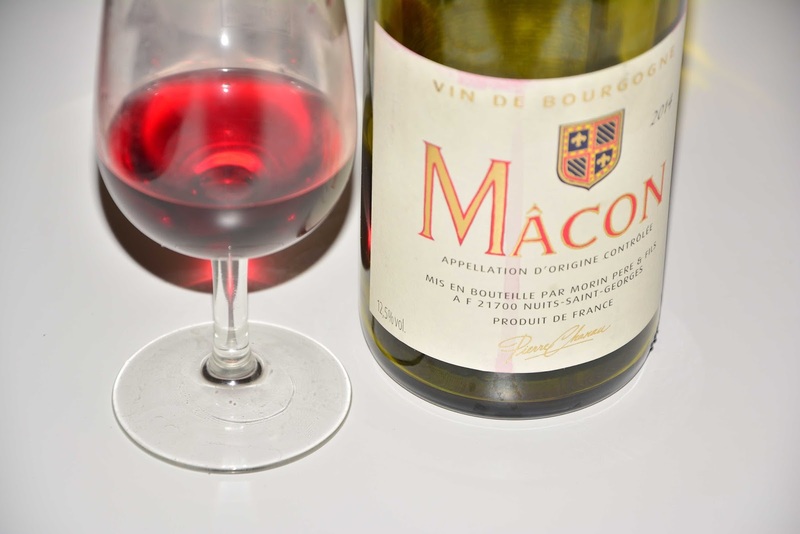 It should have an alcohol content of about 12.5% but should have less tannins so that it does not leave a taste behind. Chicken roast has a deep and complex flavor and you do not want your wine to outdo it. 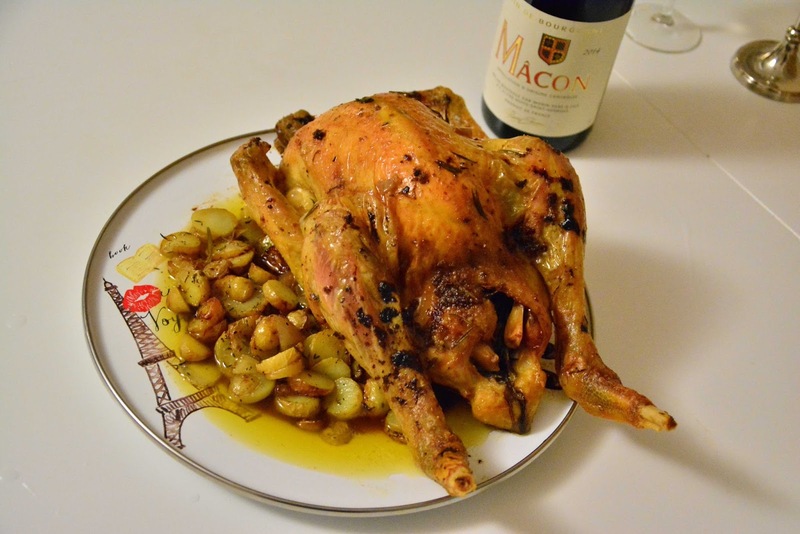 Here is a list (in French) of wines that can go well with this dish. 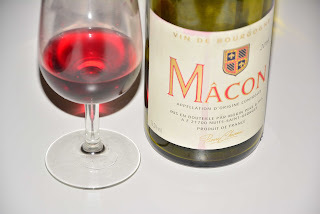 I got myself a light bodied (light colored) Burgandy wine with AOC Mâcon. You can see the light color of the wine from the picture. 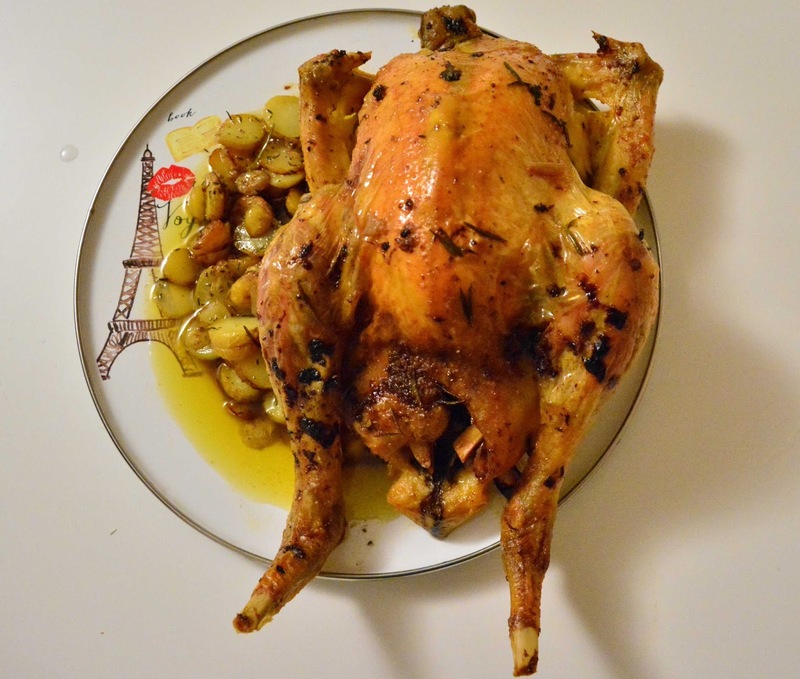 A perfectly roasted chicken is a delight to eat with friends and family at any dinner party. During my stay in the Paris region for the last 6 years, I had the opportunity of speaking to many locals, some of whom are known to make the perfect roast. Wash the chicken and then pat with a kitchen napkin to remove the water. 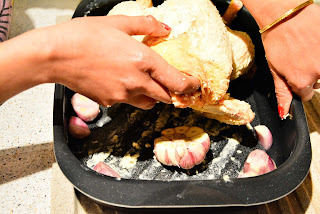 Massage the chicken well with unsalted butter that has been seasoned with salt and freshly ground black pepper. With the help of your finger slowly separate the skin from the flesh in one of the sides of the leg and slowly push a dollop of seasoned butter into it. 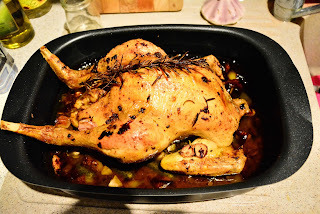 Place the chicken on a bed of unpeeled garlics and shallots. 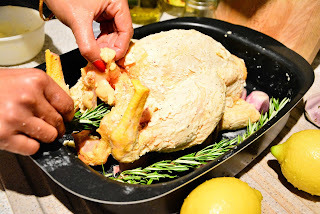 Place some strands of fresh rosemary and fresh lemon zest underneath the chicken. Fill the cavity with unpeeled garlic, shallots, fresh rosemary and lemon zest. Cover the opening of the cavity with any extra skin hanging from the chicken. 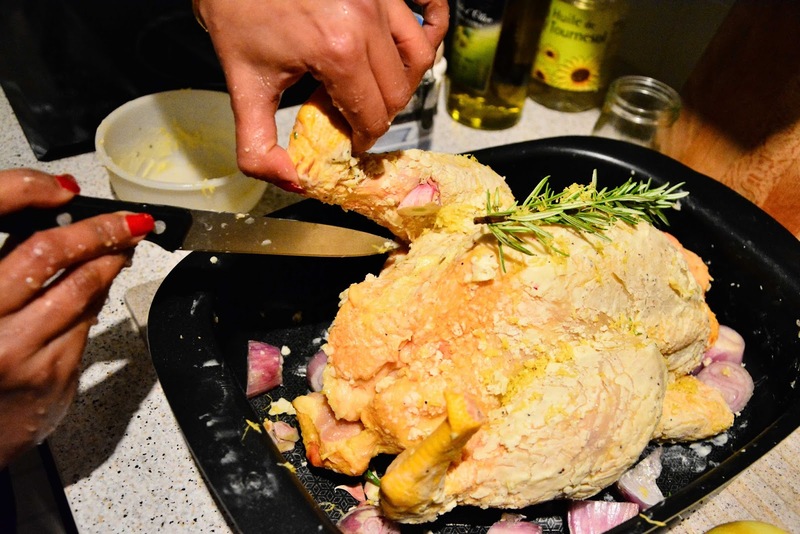 Remember to place some unpeeled garlic, shallots, fresh rosemary and lemon zest in the joints of the legs and wings. Poke the skin underneath the joint of the legs and wings. Bathe it in olive oil nicely. 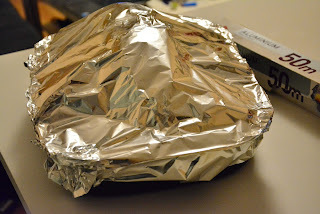 Rest the chicken by covering it with aluminum foil for the same amount of time that you took to roast it. This may function to night. Even a hormone-free leaves poultry that's so tender and succulent from a current market that sadly is not close where I stay but worth the drive. The oranges would never grow so I will use ones out of the store, well ventilated. I will create pan sauce from the drippings and we'll have mashed potatoes with fried chicken combined. Oh gosh I have never needed breakfast yet and certainly will try to eat this right now.